We all want to find the bar where everyone knows your name. But when you can’t find that, just head for the place where everyone will recognize your Rebel Alliance necklace. 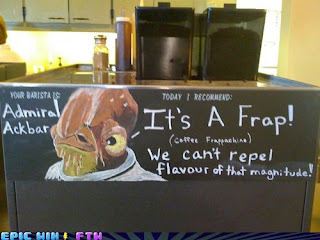 If a bar or coffee hang-out has anything geeky, I will go. Build a Stargate, we will come. Besides the fact that it is just cool, it’s also a giant welcoming mat for people that might feel out of place at hipster joints. Proprietors don’t just put in a TARDIS because it’s cool. Well, they probably don’t. Chances are they are a huge, passionate fan. You walk in knowing that you’ll have something to talk about, that there’s already a connection, that you have a place. That you might even get to geek out with someone about the exact scale of Slave I. It makes a big difference. 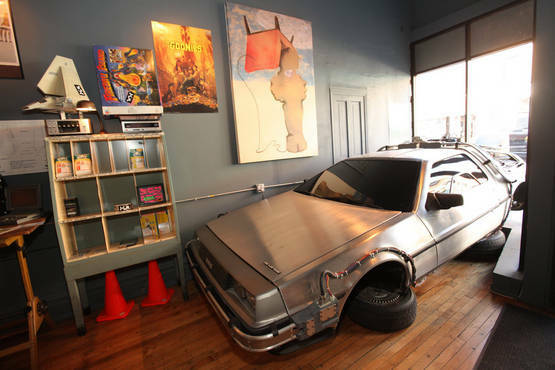 Here are some places where you can get your geek on. 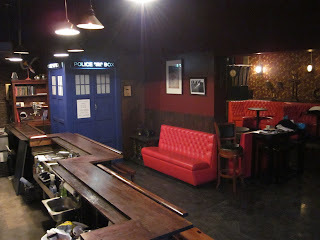 Waystation Bar - This steampunk-y bar recently opened in Brooklyn; it has a TARDIS. I’m sure you’ve seen it around the internet lately. It’s not just a faux front either. The TARDIS is the bathroom. For reals. 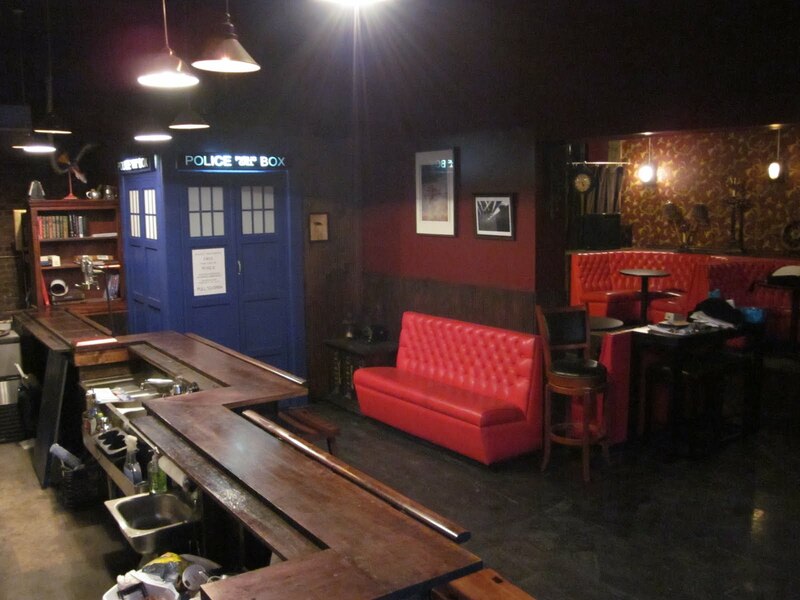 I hope someone takes pictures of the inside soon and that the bar keeps running with a Doctor Who theme. Just think of the drink possibilities! Sonic Screwdriver, Gallifrey Sky, Dalek Exterminator… I wonder if I can mail away for a “Geek Mixologist” certificate. ﻿Wormhole Coffee - Reviews state that this Chicago coffee shop lives up to its cool name and that they serve tasty coffee. No, they don’t have a Stargate. They have a DeLorean though, and I think that’s an okay substitute. You can also find movie posters, Ghostbusters gear, and some old Nintendo games. If I lived in Chicago, I might camp out here regularly. Please spill the beans (ha, get it? Beans!! As in coffee beans!) if you know of a place like this in Los Angeles. Starbucks at Lucasfilm - This Starbucks is at the Presidio (specifically in George Lucas's Letterman Center). The location can’t help but absorb the geekiness from Lucasfilm. There are Star Wars trinkets and also, just look at Ackbar. I would love to overhear some of the conversations that take place there! 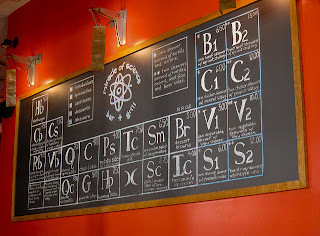 Miracle of Science Bar & Grill - Periodic table menu. Enough said. This place in Cambridge could take the theme a little further though. It’d be extra awesome if they served beverages in beakers and shots in graduated cylinders. 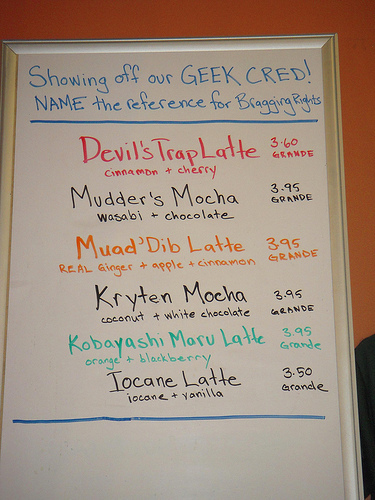 Wayward Coffee - Just look at that list of nerdy drinks. That is enough to make me pick this shop above all the other coffee holes in Seattle. What can I say? 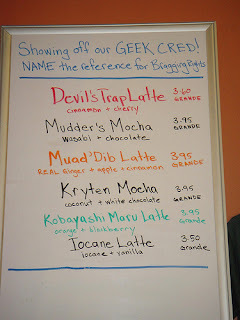 Sometimes a girl just wants to order a Muad’Dib Latte. I can’t admit that I knew all the geeky references on this list (Kryten stumped me). How many do you know? It looks they are temporarily closed, but as their site says “Our hope is that we can resume providing the best coffee in the 'Verse as soon as possible.” Yeah, admit it. You love them a little too. Do you know somewhere fabulous that I left out? Leave the information in the comments, and I’ll keep adding to this list! Kryten is from Red Dwarf- an awesomely 80s/early 90s British TV show. You should check it out! I watched the whole thing on Netflix a couple months ago. Also, Grim's on Capitol Hill in downtown Seattle has a cool steam-punk thing going on, drinks are served in mason jars, which I think is way awesome. But its not really focused on any "geeked out" theme. Been to the Starbucks at LDAC. My family and I probably hung out way longer than the staff and LDAC would have liked! But it was so cool in there! I haven't been to Wayward in awhile (don't live in that part of town anymore), but they are always super friendly and welcoming, and the walls are covered in signed sci-fi photos and posters. They have Whedonverse trivia nights, Sci-Fi movie nights, and they are the unofficial Browncoat headquarters in Seattle. 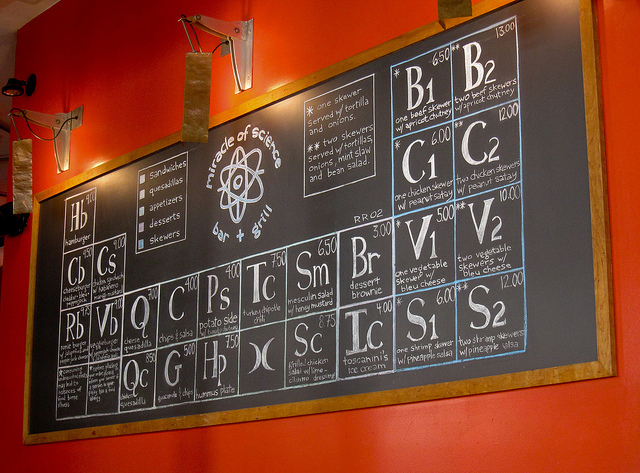 LOVE the Miracle of Science Bar & Grill!!! They should order their beverageware from ADVANCE! I can see someone in the Seattle area calling a coffee shop Red Dwarf or Kryten's. maybe even going as far as Kryten's Korner. I know if that place were down south in the Kent Auburn area I'd be there a lot. Paul - There should be a Ten Forward! I really liked Quark's Bar in Las Vegas too. Pity that it's closed! I know I need to watch Red Dwarf! So little time for television though. It's soon-ish on my list after Doctor Who and Farscape. Elizabeth - I'm glad it's on Netflix!! amy - I like drinks in Mason jars. Reminds me of my childhood and of sweet tea. Thanks for the heads-up on these too. I'll be in Seattle in October, and I definitely need to make the rounds. Kathleen - That makes them even cooler! Marianne - They could definitely carry the theme a lot further!! Sadly, the Wayward has been closed since November, and is in search of a new home. ...but strangely it's not geeky at all. Like...AT ALL. Just the name. Very baffling. Everyday 2-4 cup coffee can reduce the risk of type 2 diabetes. Coffee also reduce the risk of liver cancer. Dear coffee i love you very much for those health benefits. I like to drink different type of coffee. Best coffee brands.